How is it that the song Moon River became associated with Andy Williams? 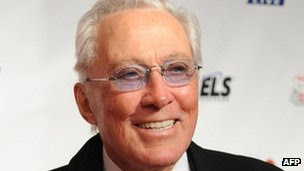 With the death of Andy Williams, BBC radio were referring to Andy being remembered for Moon River and that he performed the song at the 1962 Oscar ceremony. Online BBC says ... He was best known for the song Moon River, the Oscar-winning song featured in the film Breakfast at Tiffany's. Wikipedia says .. Williams owned the Moon River Theatre in Branson, Missouri, named after the song "Moon River", with which he is closely identified. From what I remember Andy's version was an album cut, the hit singles belonged to Danny Williams in the UK and Jerry Butler in the US? Going to the guy who has done the research on what records sold in N.Z. before our chart system got more organised and published, I asked Mark Matheson how did Andy's version do in N.Z.? Very well, said Mark, It was the flip side to Can’t Get Used To Losing You. Was played well and the album sold in the thousands. All three versions sold well here. His would probably the best remembered now I would think as the other two faded out of sight in New Zealand. He also had huge hits earlier here with “Butterfly” “Lips Of Wine” “I Like Your Kind Of Love” “Lonely Street” “Hawaiian Wedding Song” & “The Village Of St Bernadette” etc.